NS Kannan has been appointed as MD of the company effective June 19, 2018 subject to IRDAI approval. Punnet Nanda has been promoted as Deputy Managing Director of the company. 94 of the top 113 managers have been with the organization for more than 10 years. Company boasts a strength of 17,000+ employees. Range of product have been increased to ensure customers’ on-boarding and service through distribution architecture. A diverse distribution architecture helped translate product and service into business. Nuclear families are growing and need to protect loved ones from losing family income is on the rise. Retail customers are borrowing to make assets and need to secure them through insurance. The company is devising solutions and products to cater to this need. The protection APE growth was 48.1%, with protection accounting for 8.2% of APE. Customer retention has improved by changing the organization and partner culture. Customer retention actually creates profitability to the company and is best parameter to gauge customer experience. 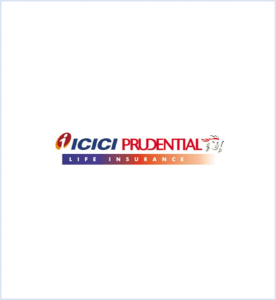 The efforts to increase customer retention led to 13% growth in total premium and 29% growth in yearly retain renewal. Also, 13th month persistency was 85.8%. Focus was on technology and re-engineering to improve on expense ratios. But, increasing focus on protection will lead to increment in cost ratios. The Value of New Business for Q1-2019 was Rs. 2.44 billion with a margin of 17.5%. The growth would be led by rising working population and increasing per capita income for both savings and protection businesses. Retail business accounts for 96% of new business APE. It has marginally reduced because of increase in group protection business. Private market share continues to be around 21.0%. Whereas total market share of 11.3% was a decline from 11.8% in FY 2018. The first 2 months of FY 2019 saw 30% decline in RWRP numbers because of strong first-quarter in last year due to demonetization. RWRP numbers for June were 36% higher than that of May. Year-on-year decline was low at -5%. Non-bank channels contributed to almost 45% of APE. Different channels like agency, bancassurance partnerships, proprietary sales force, corporate agents and brokers including web aggregators have been developed. ULIP were focal point in delivering lower cost and lower persistency risk to customer while offering transparency. Cost to TWRP ratio was Q1-FY2019 as compared to 14.2% for Q1-FY2018. Cost to TWRP for saving business was 13.7% compared to 12.5% for Q1-FY2018. Commission Ratio is stable at 5.5% is stable and is higher than Q1-FY2018. Non-commission component of cost has gone up by 40%. For Q1-FY2019, 73% if new business policies are issued within 2 days, 61% of renewal premium is receipted through electronic mediums and 99% of customer-initiated pay-outs are processes electronically. 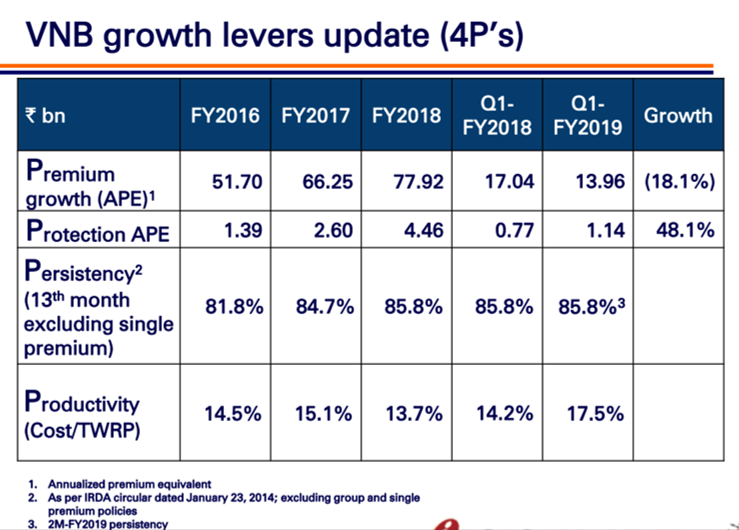 Total premium increased be 13% to Rs. 55.18 billion in Q1-FY2019. The decline in profit is because of increase in expenses with focus on protection business. Expenses grew by 43.4% in Q1-FY2019 because of increased ads and publicity. Solvency ratio continues to be a very strong number at 235%.